Look up Slimming World Success Stories on Google and you'll quickly be reminded of what kind of changes you can expect to see in your life by simply sticking with the programme. Unlike a lot of other diet plans it feels like Slimming World is more about the long term rewards rather than short terms (losses and gains!). 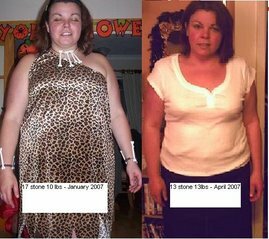 Yummy Mummy loses 3 st 13lbs. Military wife drops 8 dress sizes and 5 1/2 stone!